I try to understand how the hostname redirection system is working with Microsoft system. When I go on api.mydomain.com or on api-staging.mydomain.com from my network all is working fine because my DNS (server10) is properly used by my browser or my router (I don't know). When I go api.mydomain.com or on api-staging.mydomain.com from outsite, from web, I can reach my api host by I get an error 500 for my api-staging host. 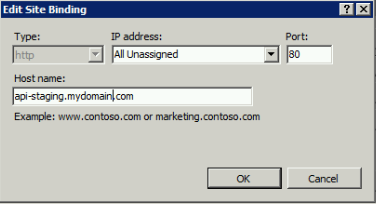 This seems logic because It seems the URL Rewrite tool simply replace http://api-staging.mydomain.com/api by http://server24/api in place or redirecting the query with same header and parameters to my server24. 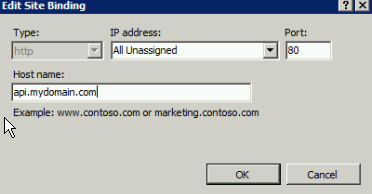 FYI I can properly setup the reverse proxy with Nginx of Apache solutions but I really would like to do it with IIS. It should be possible. Or maybe I must redirect the initial query base on information in my local DNS and I don't know how to do. Last info, I don't want to have to do this in my firewall/router. 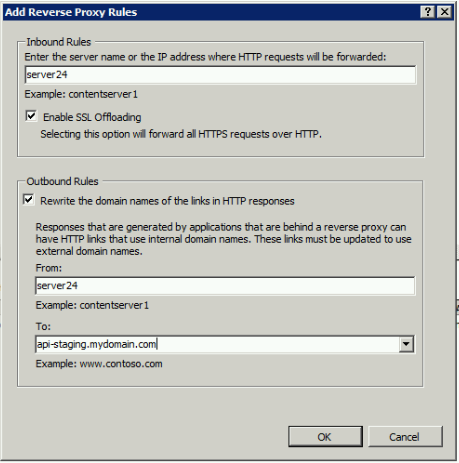 Browse other questions tagged reverse-proxy iis-7 or ask your own question.